Many patients with type 2 diabetes mellitus (T2DM) are unable to maintain glycemic control despite dual therapy with metformin (MET) and sulfonylurea (SU). In this multicenter, double-blind study, conducted primarily in the Asia-Pacific region, 427 patients on treatment with an SU in combination with MET ≥ 10 weeks were randomized (1:1) to sitagliptin (SITA) 100 mg/day or placebo (PBO) for 24 weeks. At Week 24, the least squares mean (95% confidence interval [CI]) changes from baseline in A1C (%) were -0.84 [-0.97, -0.71] for SITA and -0.16 [-0.28, -0.03] for PBO, with a between-group difference of -0.68 [-0.87, -0.50]. Subgroup analyses (shown below) demonstrated improvement in A1C with SITA vs PBO for all subgroups tested. The improvement in A1C was greater with higher baseline values (data not shown). Symptomatic HYPO was reported more frequently for SITA (12.9%) than for PBO (3.3%). The two treatment groups were similar in other aspects of their safety profiles. 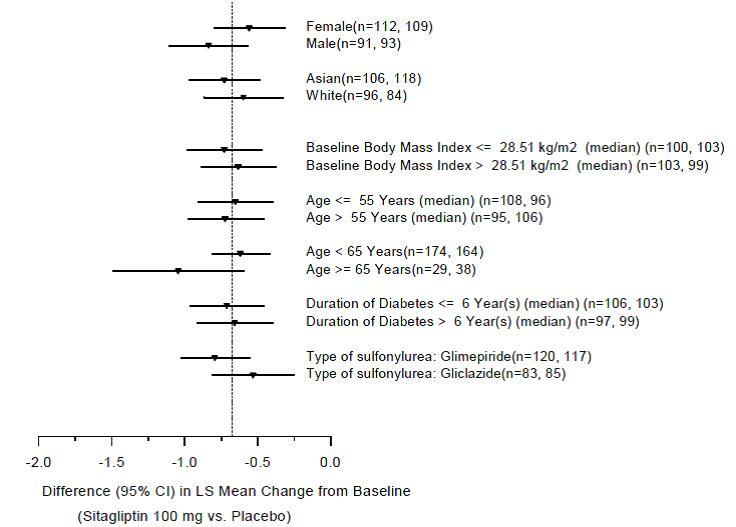 In this study, SITA 100 was generally well tolerated and provided good A1C-lowering when added to dual therapy with SU and MET in patients with T2DM.